Welcome to the wonderful world of aviation. As you’ve already discovered there is a lot to learn. But I relate learning to fly like learning to drive. When you first start learning to drive you literally have to “think” about what you’re going to do before you do it. Then after you’ve been driving for a while it all comes second hand. Subconsciously you know what to do. OK, so take that same idea and multiply by a factor of 10 and that’s how much more you have to remember when you fly. It takes a lot practice. Remember to always watch your airspeed. Too fast and you’ll overshoot your turn or the runway. If you go too slow then you will stall and drop out of the sky. This is not a good thing when you’re close to the ground. 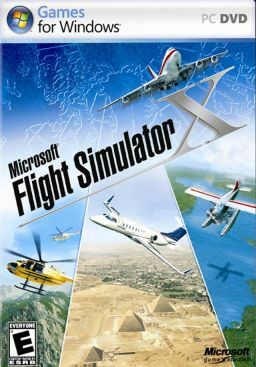 There are lessons built into FSX which you can fly and get used to the different aspects of flying. Unless you are using rudder peddles when flying FSX it will be difficult to manage drift appropriately when on final approach. Finally, another book you might want to consider buying is one on aviation weather. Understanding weather is critical to the success of your flight especially when you go cross country. You NEVER want to put yourself in the position of saying, “I think I can make it.” Many, many dead pilots said that before they took off trying to beat the weather. Thanks for the advice. I’ve never tried the lessons yet, normally my boyfriend is just standing over my coaching but since he’s gone on a trip now is the perfect time to try them out. We do have rudder pedals, which is nice. We also have a joystick and a throttle. Obviously, I’d love if the controls were more like the ones in the plane but at least they aren’t a mouse and keyboard. I completely agree with getting a book on aviation weather. Sometimes I still struggle with how much wind is too much, especially once I’ll be alone. Do you have any suggestions? I know we own Weather Flying by Robert N. Buck but I’ve only heard it is good for IFR not specifically VFR. As a licensed pilot with many hours logged in general aviation aircraft and military jets I can tell you that wind is not something to worry about. I say this with confidence as your flight instructor should, at some point in your training, introduce you to cross-wind landings. At this point you’ll have plenty of opportunity to practice. But until that happens here’s what you can do to simulate crosswind landings in FSX. 1. When you first open FSX you will note there are 4 selection boxes on the opening screen, one of which is for weather. Click on the one for weather. 2. The next screen you will see is one that allows you to choose your weather options. At the bottom left it says “User-defined weather.” Click the round radio button next to “user-defined weather” and then click the button that says “customize”. 3. The next screen that appears will have 4 sliders on the right side of the screen. The slider at the bottom allows you to select the speed of the wind. Right below that is where you can adjust the direction of the wind. Remember – the direction you select will be the direction the wind is coming FROM. Just above the small circle is a red triangle. Put your mouse over the triangle and click and drag it until you have the direction you want. The top of the circle in North(360). That’s it. If you have any other questions, please don’t hesitate to ask. Here’s my personal email in case you want to touch base directly with me. email: palruss@gmail.com.